Traditionally, the process for making brined olives involved hanging raw olives, each scored with a knife and dropped into a mesh bag, off a village shipping dock into the salty water of the sea. Lacking a village dock or salty seawater, here's a way to make brined olives that results in a comparable end product. The initial water and salt curing process is similar to making lacto-fermented foods. 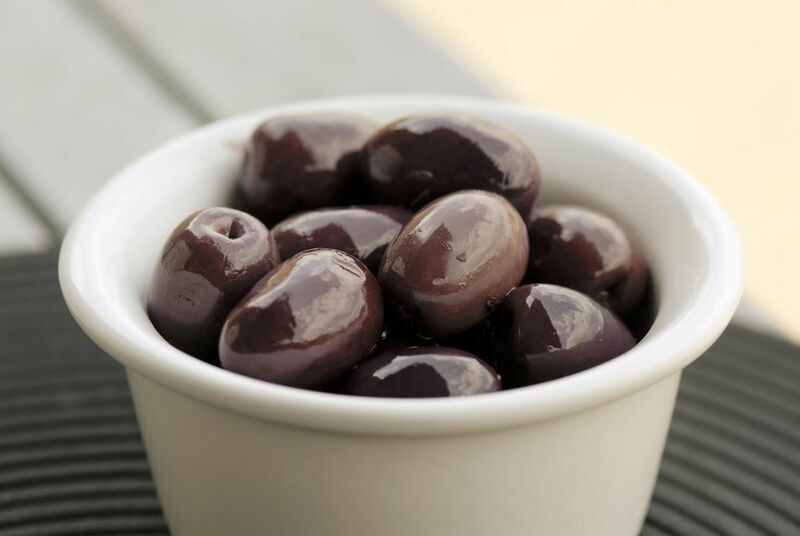 It is very close to the process used to make kalamata olives. Remove any stems or leaves and compost or discard them. Rinse the olives and briefly underscore each olive lengthwise with the tip of a sharp paring knife 1 to 3 times. Place the scored olives into a large bowl or medium-sized pot. The bowl or pot should be made of a non-reactive material (no aluminum, copper, or non-enameled cast iron). Cover the olives with cool water. Place a plate that is slightly smaller than the rim of the pot or bowl on top of the olives. Place a clean weight (a pint jar of water works well) on top of the plate. The point of the plate and weight is to keep the olives submerged beneath the liquid. Leave the olives in the water for 3 days. Drain the olives in a colander. Put them back into the bowl or pot. Make a brine by dissolving 3 tablespoons of the salt in 1 quart of water. Pour the brine over the olives. Replace the plate and weight. Leave for 1 week. Repeat the drain, brine, weight, leave for 1 week. Repeat 2 more times (one month plus three days total brining time). Drain the olives. Transfer the olives to clean glass jars (it is not necessary to sterilize the jars for this recipe). Make a brine with the same ratio of 1 1/2 tablespoons salt to 1 pint water. Stir in the red wine or apple cider vinegar. Pour the brine over the olives. Tightly cover the olives and store in the refrigerator or a cool cellar or garage for up to 1 year. The flavor will improve if you wait a week or two before sampling. Add a few sprigs of fresh herbs and a few whole black peppercorns to the jars when you cover the olives in the final vinegar-added brine. Serve combined with dry salt-cured olives for a nice taste and texture contrast.